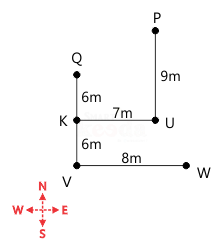 What is the shortest distance between point K and W? 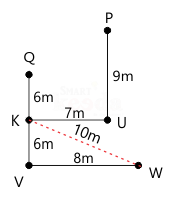 Here, the shortest distance between point K and W is 10 m.
What is the direction of point P with respect to point V? Here, point P is northeast direction with respect to point V.
Relationship between which of the following two persons cannot be determined? Following the final solution we can say that relationship between Geet – Kanu cannot be determined. Roop is father of Geet and Meet is mother of Roop. Kanu, the husband of Meet is the grandfather of Soni. Kanu has only two children, both of opposite gender. At this point Soni can be the child of either Roop or Roop’s sister. So, we will use this information later. 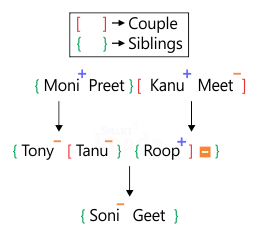 Tony is sister of Tanu whose daughter is Soni. Moni is father of Tony and brother of Pret. 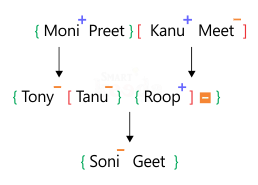 If Sona is the sister in law of Tanu then how is Tony related to Geet? Following the final solution we can say that if Sona is the sister in law of Tanu then Tony is the aunt of Geet. How is Preet related to Tanu? Following the final solution we can say that Pret can be either Aunt or Uncle of Tanu.